Rodizio isn’t exactly the type of restaurant we tend to write about here, but we’ve found it hard to ignore given its singular novelty. You see, Rodizio Grill is a, well, a rodizio – a Brazilian-style fixed price restaurant that parades out a never ending stream of skewered and grilled meat to the dining room and slices portions of it onto your plate. For $32 (during dinner), you get – more or less – as much as you want of anything and everything to eat. This includes appetizers, a ‘salad’ bar (more on that later), and meat to your heart’s content. Only beverages and desserts cost extra. Shortly after our group of 7 was seated, the food march began. Apps of fried and sugared bananas (tasty, but very dessert-y), cheese bread (flavorful, but chewy), and parmesan polenta fries (an unqualified yum) arrived as soon as seats were taken. And, as soon as the first bite was taken, we were peppered with queries from the staff. “How is it?… Do you love it?… Is it delicious?… Is everything wonderful? !” This would continue throughout the night. While seemingly well intentioned, it was frankly somewhat intrusive, and we couldn’t help but feel as though it somehow signaled an anxiety born of the tremendous investment this huge restaurant represents. Escape from the inquisition came in the form of a visit to the ‘salad’ bar, which is, in reality, a wide-ranging buffet. Beyond the cold and lettuce based offerings, there was also a wide selection of hot dishes, including pasta alfredo, mashed potatoes, beef stroganoff, fejioada, and couve. A quick pause to point out what may be obvious, should you try Rodizio for yourself – it’s dinner, you’re hungry, and there’s scads to eat at the buffet. For the sake of all that’s impending and meaty, don’t overdo it. In an attempt to take the above advice, I tried only the fejioada (a black bean and sausage stew) on rice with farofa (a toasted cassava flour condiment), and the couve (collard greens and bacon). The stew was enjoyed, we appreciated that they had farofa out, and felt pretty strongly that the tougher-than-they-ought-to-be greens simply weren’t cooked enough. 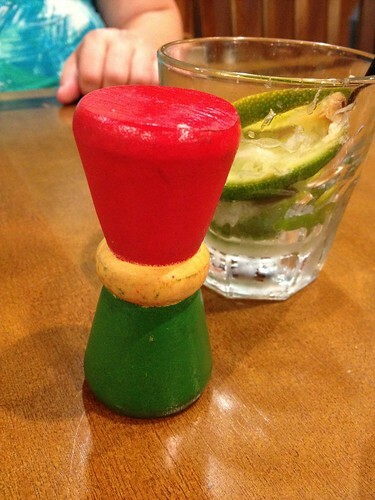 Upon returning from the bar, tongs had appeared at each place setting along with a couple of salt shaker-sized wood knobs (above), one half of which was painted red, the other half green. These knobs acts as a signal to the ‘gauchos’ with meat skewers that are canvassing the dining room – put the green side up and they ply you with their wares, red side up means you’re taking a break. Lay it down horizontally when you’re ready to concede meat defeat. Green really means go here – you’re descended upon. Men (and, curiously, they were all men) in themed and branded outfits raced over to offer up whichever flavor of meat their skewer held. Some of the offerings were small chunks that could be slid onto your plate, while others were larger pieces that required carving with knives. As they begin to carve, you grab the top of the slice with your tongs and bring it to your plate. 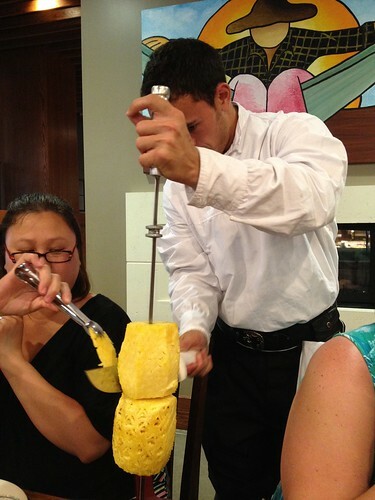 Grilled pineapple - a nice touch! To me, there’s something that’s equal parts undeniably cool and slightly unnerving about all of this. The cool – you get 12-15 intriguing and distinct meat options at your beck and call. The unnerving – it really changes the cadence of your meal: yes, yes I would like to try that… and that and that and that… and just like that it’s there, and it’s coming at you quickly, and in being a participant in this frenzy you’re swept up into the sheer kinetic nature of the proceedings, the urgent athleticism of the slicing and the sprinting from table to table and the… hey, is that the picanha I missed out on the last time around?… hey, over here! So, Slow Food it ain’t. 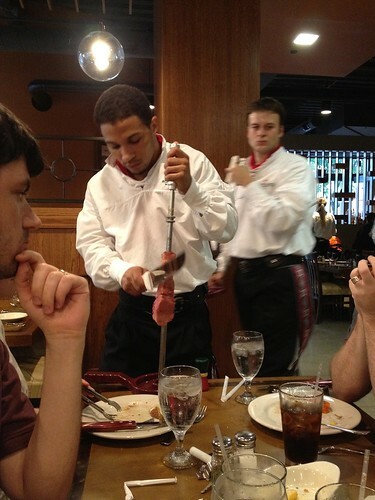 Don’t expect to carry on much in the way of conversation with anyone other than the swordsmen while eating. That said, there’s some good eating to be had, and surprisingly the poultry options were among our favorites. The sobre coxa (marinated and seasoned chicken) was tender, with a delicious and complex seasoning, and the frango agri-doce (chicken in a sweet and spicy sauce) was similarly intriguing if ever so slightly cloying. The peru com bacon (bacon wrapped turkey breast) was an easy sell, as it tasted mostly of an unusually smoky bacon. The beef offerings were perhaps a bit less exciting. On the plus side, nearly all of them were grilled medium rare and were tender and juicy, but the counterpoint is that there just wasn’t much of an emphatically beefy flavor to be found. To be fair, picanha isn’t noted for its depth of flavor, and perhaps the other cuts aren’t either, but I still couldn’t help but feel a bit disappointed. The beef options seasoned with minced garlic or with parmesan were the clear winners of this group. The linguiça (pork sausage) seemed similarly toned down. Having recently tried it at Estilo Brazil and enjoying it immensely there, Rodizio’s just OK rendition felt like a debatable use of dwindling stomach space. 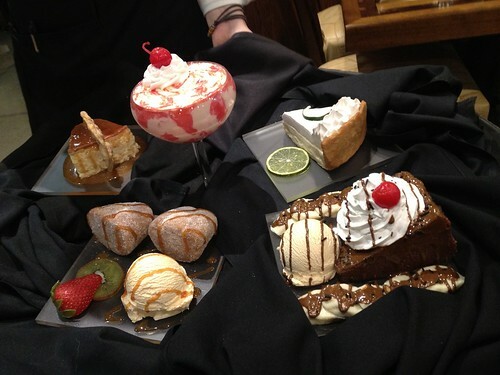 As it became clear we’d had our fill, a platter of (fake but eye-catching) desserts was presented to the table, and each was thoroughly explained. We settled on the rabanada, which is described as ‘a warm cinnamon pastry with a creamy center, served with vanilla ice cream and laced with caramel sauce’. That’s exactly what we got, and it did a competent job of satisfying a sweet tooth. Rodizio’s environs have an upscale hotel restaurant meets Las Vegas buffet feel, and can apparently seat 300 people total. And, from the space to the service to the – how else to say it? – dispensation of the food, all was very tightly executed and choreographed in a manner that’s nearly unheard of in a restaurant that’s been open for only a week or so. In other words, they hit the ground running. Now, I’ll humbly submit that, having achieved such a feat, they should take a deep breath and relax a bit. 125 W. Nationwide Blvd in the Arena District. We tried Rodizio about a week ago. The blog post accurately describes the experience in terms of the pace and intrusiveness of the dining process. We found the food to be VERY average. The “salad” bar was vast but moderately appealing. The meat items that were brought to the table were often over cooked and dry. There is no way we could (or would want to) each eat $32 worth of this stuff. With tip and virtually no alcohol (my husband had one Yuengling) and no dessert we left with a bill just under $90. I can think of about fifty other restaurants in this town where I would rather drop $90! My husband said, “we could have had a killer dinner at Basi Italia – twice!” Hell, I’d rather go to Los Guachos ten times than go back to Rodizio. I wish them continued success and just hope that all the convention-goers end up here so the crowd is smaller at Basi and Rigsby’s! I think it is catering to the unsophisicated diner, the diner looking for “entertainment” or the corporate executive with an expense account that allows him/her to spend recklessly. Dining at Rodizio reminded my co-worker and I of dining on a cruise ship or at an all inclusive resort – minus the ocean views and calypso music. Good but not great. Designed to serve a crowd.